The scent is White Jasmine & Mint. It headlines with a country garden chock full of spring time blooms, including orange blossom and rose to name a few, and settles on a beautiful study of jasmine that is neither too rich nor too cloying. Jasmine can come off as a bit overpowering in some fragrances but not so here. Not even a little bit. Instead, it is soft, a bit sweet and a tiny bit sensual. As the fragrance evolves on the skin, it becomes herbaceous, all while retaining a refreshing quality. The key word here is fresh. Garden mint, gentle chamomile and grounding tea freshly blend so well together, leaving a soothing fragrance on my skin that falls somewhere between floral and spice. I must say for those who fear mint in fragrance, the mint is not an Altoid that overwhelms the palette in an effort to annihilate any other odor. 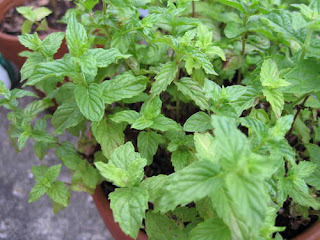 It is more like a sprig of mint leaf in an iced tea - noticeable but subtle. At the end of the day, the fragrance remains very close to the skin. Over the course of wear, the sillage is slight, so I literally spray this one with abandon without fear of overwhelming anyone. Most importantly, I wear it for me. Its refreshing qualities and herbaceous tea-like conclusion have become my personal aromatherapy for a sweltering day, no matter if I am headed to work or to the market. I recommend layering it for daywear during spring and summer. For those aspiring to greater longevity with White Jasmine & Mint, I layer with the body cream and I find it lasts a full eight hours on my skin. I also enjoy layering it with Verbenas of Provence, Nectarine Blossom & Honey, Blue Agave & Cacao and Orange Blossom, all from Jo Malone. 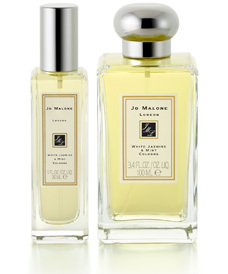 Jo Malone White Jasmine & Mint can be found at Saks Fifth Avenue, Neiman Marcus and Nordstrom. A 30ml bottle retails for $55 and a 100ml bottle retails for $110. The scent can also be found in body cream, body lotion, bath oil and a candle. I strongly recommend the candle for your home! This sounds so wonderful. I very much appreciate the notion of wearing a scent mainly for purposes of aromatherapy and personal enjoyment. I have found that the right scents during the appropriate times can have significant mood altering effects. Whether bringing a calm state of mind or inciting joy.